The 4D process is at the core of the Appreciative Inquiry model – here we outline Appreciative Inquiry and the four steps involved in the system. The more you berate someone for their poor performance and continuously highlight their flaws, the more likely they are to lose confidence and regress. Conversely, if you take a positive approach and draw attention instead to that person’s strengths, there’s a greater chance of them working on and developing those competencies even more. That is the premise behind the theory of Appreciative Inquiry, which states that people, teams and organisations naturally head in the direction in which they consciously ‘inquire’. This has an almost endless number of applications, for instance in performance feedback and improvement. Whether we choose to dwell on a manager’s strengths or weaknesses, their development is likely to gravitate in the direction we choose. Leader/Manager 360 degree surveys take Appreciative Inquiry theory to heart, making sure the subject’s strengths are highlighted, providing constructive feedback for improvement. 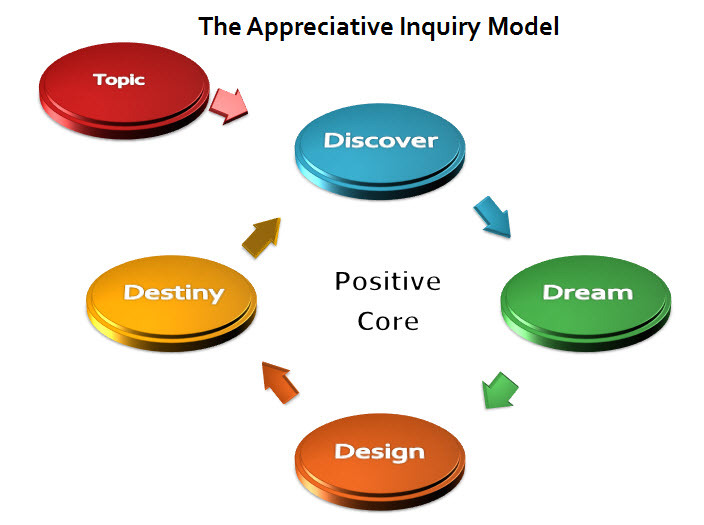 Taking action on insights is obviously the most important part of any personal development method – so how does the 4D model of Appreciative Inquiry seek to enact change? In this initial stage of Appreciative Inquiry, efforts are focused on elaborating on current positives and strengths – looking at the best of ‘what is’. 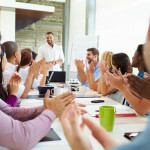 Through discussions and feedback, the ‘positive core’ of the subject – in this scenario, a manager’s workplace performance – is reached, providing a foundation for further development. Next, time is spent contemplating ‘what might be’, or how we would like things to be in the future. Given the positive core that has been determined in the Discovery stage, what are the possibilities that may be attained if we continue to develop and grow this core? Here, the first steps are taken to turn this speculation into reality. What steps must be taken in order to transition from the present state to the vision generated in the Dream stage? It’s now time to move towards progress and make the desired state a reality. Through this constructive four-step process, it’s easy to see how a range of entities – from individual managers to entire organisations – can continuously improve. Leader/Manager Model™ surveys make use of the Appreciative Inquiry model, using the power of positive feedback to help managers of all levels reach their Destiny.